Plot: A young family move to a new home and discover the quaint Pet Sematary down the lane holds a dark secret. A touch wooden, a little bit out of balance, Pet Sematary is nonetheless a horror that makes you more than okay about your parents sending that family dog to ‘live on a farm’. 30 years after its original release, Pet Sematary returns thanks to the latest version of the film in cinemas now. But does the original, a film which Stephen King himself scripted based on his own novel, hold up three decades after its release? In truth you can count on your fingers the good Stephen King adaptations, and there have been over 50 for film and television. As a rule of thumb, the less involvement King has on the film, the better they tend to be. He’s spent most of his career distancing himself from The Shining, Stanley Kubrick’s seminal horror based on King’s book. So the original Pet Sematary, which also includes a brief King cameo, is already on shaky ground. Moving from Chicago to rural Maine the Creed family look set to live in idyllic bliss. But when Louis (Dale Midkiff) befriend neighbour Jud (Fred Gwynne) he learns of a local burial ground known as Pet Sematary where the local pets are all laid to rest. 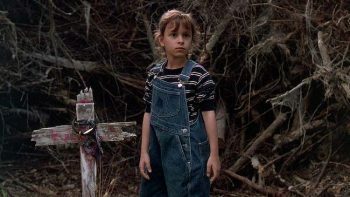 When the Creed’s cat is run over on the busy road next to the house Jud reveals there is another aspect to Pet Sematary, the ability to bring the dead back to life. For horror fans Pet Sematary is a solid little number. It’s less interested in scares than it is unsettling and horrifying. The final act contains some genuinely disturbing elements and the slow-burn build to this makes it worth the investment. King does a fine job of etching out his characters, building them up, to then tear them down in brutal ways. Some of the gore on offer is nausea inducing practical effects that hold up years later. Thematically it does well to instill ideas of grief while refusing to let go. But structurally it gets a little lost. As fans of King’s written work will know, he likes to detour when it comes to narrative, all in a brilliant manner of giving greater insight into who these characters are and why they are motivated to do what they do. It works wonderfully on the page but when you try to condense so much narrative into a tight film running time some things are going to have to be sacrificed. So Louis’ motivation gets lost at times. His wife Rachel (Denise Crosby) has the most terrifying subplot of the film but it brings little to the main story other than to scare the absolute crap out of you. Perhaps that’s reason enough. A touch wooden, a little bit out of balance, and with a sense of ‘made for TV acting’, Pet Sematary is nonetheless a horror that makes you more than okay about your parents sending that family dog to ‘live on a farm’.